My childhood is riddled with strange, obscure PC games. The problem was picking one that A) my inadequate, blurry memory can remember, and B) I could get working on my current computer so I could show it in all its glory. Well, I narrowed down the list to just a few games, then picked one. I picked Lemmings, a game which is so strange and badly designed that -- wait, what? You've heard of Lemmings? I thought I was the only one who'd played -- OH. I read that wrong. This is Lemmings Paintball. Well, that's basically the same game as Lemmings, right? So what is the paintball variety of Lemmings? We just don't know. 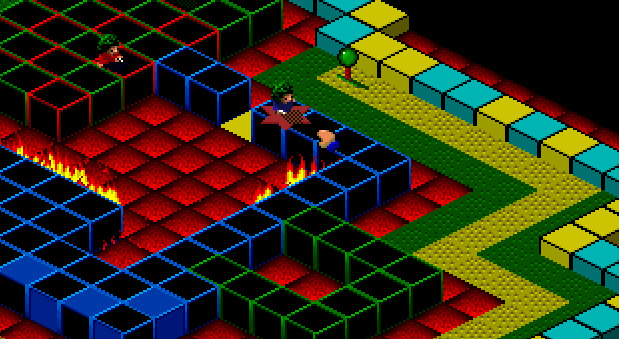 At a glance, it looks like a 3/4 top-down isometric action platformer shooter thingy. Actually, that's a pretty good description of it, I guess. Is it a good game? Well, yeah, I kind of think it is. 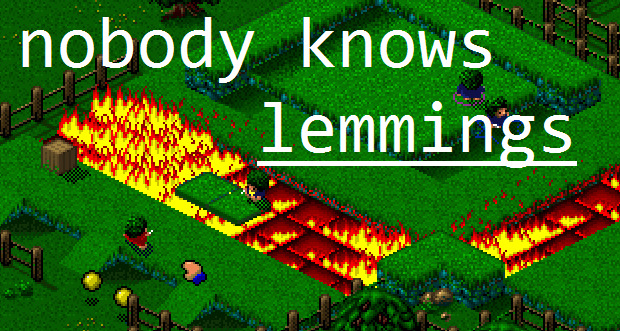 You control up to four lemmings in a squad. In every level you're dropped unceremoniously out of a random box that appears in the sky and have to make your way through the level and grab up to four flags. The gameplay is pretty simple. You click somewhere, and your lemming attempts to walk there. He's pretty short, though, and in typical lemming fasion can't climb much. 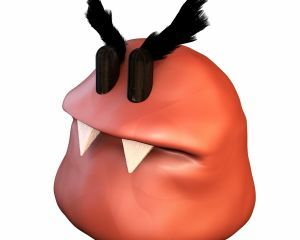 And roving through most of the level are evil lemmings (as in all good games, people on the other team are simply evil) that will attack you with their eponymous paintball guns as you approach. Of course, you're also armed with such a gun and can squirt paint at them first. So screwed. How did I let this happen!? Actually, those red lemmings are heinously good shots; if you're standing still, they will nail you in a hurry. Pretty quickly you start to develop this technique of dodging side to side while shooting, which works well in most situations. The charm of this game comes partly from its aesthetics and partly from its level design. Aesthetically, I love that there are several different environment skins: snowy, grassy, military base, multicolored abstract blocks, etc. I like the triumphant backflip animation my lemming does when he gets the flag, accompanied by a diminutive "Yippee!" I like the satisfying splat of the paintball against the enemy. I even like the unmistakable creak of the gates opening. Just all in all, the sounds and graphics, though not oustanding in any way, just work. What I'm trying to convey is how all the levels are filled with what I can only think of in my mind as "little delights." You never know what combination of gadgets you will play with in the next level. My other lemming is just off screen to the left flipping the switch. And they use all these different elements pretty well. For example, in one level a lemming flips a switch to toggle the position of alternating raised or lowered walls, so that a teammate can get past. 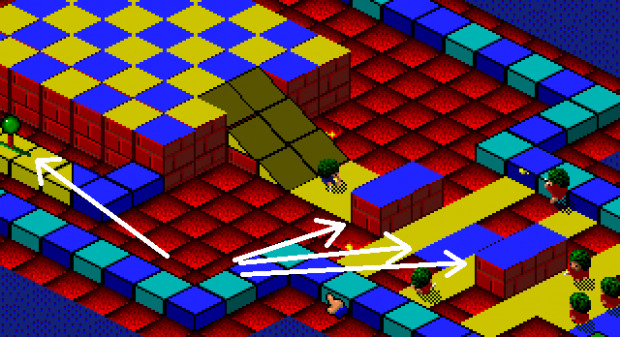 It's a pretty simple "puzzle", but it's made more interesting by the fact that enemy lemmings are patrolling the route amidst the moving walls. If your timing is bad, the enemies will actually be standing on top of the walls and have very easy shots at you. In another level, flipping a switch does seemingly nothing... except, if you awaken your sense of exploration and experimentation, you'll find that a particular walkway has now become slippery, so you can slide off a ramp and catch some sweet air on the way to the flag. Another thing I like is that, for the player with a sharp eye, there are shortcuts in plain sight in some of the levels, but the particular layout that they've put in naturally guides your eye to some other, longer, more perilous path. In fact, several of the levels seem to have multiple paths through, and it's fun to experiment to see which are the riskiest. Despite all these fun and interesting things, some of the design decisions have that primitive quality that we feel we've left behind with modern games. 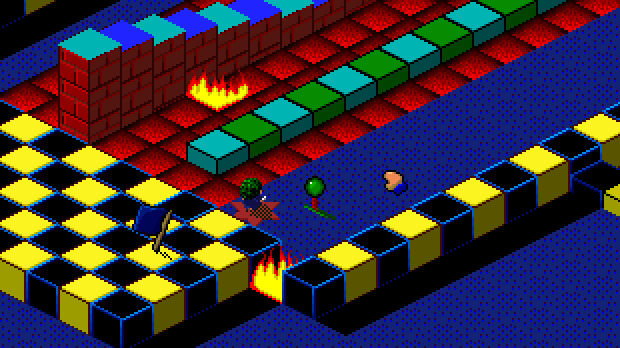 If you get shot by an enemy lemming, you usually have to start the entire level over. And some of the hit detection is spotty; your lemming may walk off a cliff due to what seemed like an innocuous click. And if you're controlling multiple lemmings in your team at once, they really do what you say, not what you meant. The sympathetic critic in me wants to say say that maybe this is thematic, in keeping with the chronically braindead nature of the creature that is the lemming. As an aside, this is a pretty old game. When I bought it as a kid, it came on a CDROM, but when I look at the size on the disk, there's only 15 MB there! I guess back then it was either 10 floppies or a CD, huh? As another aside, it ran without any issue on Windows 8. That was pretty surprising! I don't want to call this game seminal or important or anything (the game flopped; I'm writing about it in a blog about obscurity), but you'll find most of the level design elements present in contemporary games, such as the coordinated timing-based puzzles between multiple teammates. This game is not fantastic, but it's not bad. Good luck finding a copy, but if you do, I promise you at least ten minutes of fun out of it.